In future editions we’ll be covering such areas as: updates on what’s happening on the platform; the processes that underpin what we do, such as lending criteria, recoveries and the like; profiles of the business being financed through the ThinCats platform, along with analyses of the broader P2P lending market, such as the coming Innovative Finance Isa. If you have any comments or requests, we would love to hear from you. You can contact us at newsletter@thincats.com. A – still relatively – new year is traditionally when we all resolve to do the right thing, whether it be for personal development, career, family, or just our livers. At ThinCats, we’re resolving to drive the changes begun late last year, with the investment from ESF Capital. Our resolution is to build a market-leading peer to peer lending business, offering the best rates and deals, supported by the best technology and operational framework. At the start of December we emailed you with an update as to what this investment would mean: more resources and more people, a better operational structure and IT, and more communication. With regard to the latter, you may have already seen the Weekly Deals mail. While most of the information contained in it is already on the site, we recognise that not everyone will visit ThinCats regularly. We will look to add more information to it in due course and, in response to your requests, have already included Sponsor and loans in drawdown. And, of course, there’s this Newsletter. We’ll be following this up with raising the ThinCats profile much more – started last year with a new homepage and online advertising. But this only scratches the surface. As you probably know, there’s a new Innovative Finance Isa in the pipeline. We are looking at launching our own version, offering you another way of investing with us in a tax-efficient manner. We’ll provide more information on this in coming editions of this Newsletter. We will be rolling out a credit rating on the platform, giving you more information on which to base your investment decisions, with a release later on this year. Again, we will keep you informed as things become more concrete. We have applied for full regulation with the FCA. See the article in this newsletter. There is going to be a lot of change. All this will lead to a more robust platform, more deals offering more choice, with greater liquidity. The change will be in a controlled, risk-aware manner throughout. The security of your assets is our first priority. That will be reinforced over the coming year, as will the opportunities for you to grow them. Please do not hesitate to contact us at newsletter@thincats.com with any questions or if you have any concerns. Regulation of the peer to peer sector has passed from the OFT to the FCA. Other than a change in three-letter acronym, what does this mean? The bottom line is, Financial Conduct Authority oversight means the introduction of prudent and consistent operating principles that are in line with the rest of the financial services industry. Before April 2014, there were about 57,000 consumer credit companies regulated by the Office of Fair Trading. These ranged from payday lenders such as Wonga, through credit brokers to the P2P lending sector. With the wind-down of the OFT, 50,000 companies are transferring to the FCA. Under the OFT, basic standards were in place, but there was little oversight. Monitoring will be more stringent under the FCA: more responsibility for the regulator means it needs to be as secure as possible with the platforms it deals with. P2P platforms will have to demonstrate they are acting in their clients’ best interests. robust anti-money laundering controls and know-your-client requirements. Firms have to demonstrate that these and other operational factors are in place. Lenders will have the assurance of a more stringent level of regulation over the platforms through which they transact. The FCA can shut any platform if it is not satisfied by its standards. Firms making the transition are now operating under interim permissions from the FCA. Those who missed the October deadline will have to apply as new companies, and will not be permitted to trade. ThinCats has been bolstering its compliance resources, which we will continue to develop. “We have a robust compliance monitoring process, which has to be approved by the management board, and a regular review of all relevant areas, done on a set cycle.” Training on identifying and reporting financial crime, treating customers fairly, compliant marketing materials and the like have all been reviewed and upgraded. T&Cs, which will be published soon. We are bringing institutional asset management standards of monitoring and compliance to the nascent P2P industry. This is increasingly what the FCA will expect: the regulatory requirements on P2P are evolving quickly, and so must we. As ThinCats celebrates its fifth birthday – the auction site was launched on New Year’s Day 2011 – and hit the milestone of £150m of loans made on the platform. As we look to accelerate our development, it’s worth a look at just how far ThinCats has come. Meier, who ran an IT company, wrote the software specification, and Caley developed the business plan. ThinCats set out to solve two problems – providing a decent rate of return to investors in a low yield world, and opening up a source of funds to SMEs in a market where this was scarce. Caley ascribes much of ThinCats’ subsequent success to its Sponsors, who source the platform’s loans: “While most of the P2P market is experiencing a shortage of lending opportunities, we have the opposite problem,” with Sponsors providing a continual stream of business to ThinCats, and a relative shortfall in lender liquidity. The liquidity issue provided the spur to ThinCats’ next phase: discussions with ESF Capital, which bought the platform in December. That opened up increased business resources and expertise: in IT, operations, regulation and marketing, to name but four. ThinCats has just reached £150m of loans made through the platform. All loans are to UK small and medium enterprises, and all are secured. ThinCats’ lending activities have covered a wide range of sectors – from windfarms to travel companies – and regions. As such, the platform’s loans offer investors a well-diversified portfolio. Kevin Caley, ThinCats chair and founder, commented: “This is more than just number – it represents both £150m worth of support for UK businesses from our lenders, who have been well rewarded with strong and stable rates of returns. Since the end of 2015, we have been putting considerable resources into improving the performance of the ThinCats platform. In the first phase, this entailed upgrading the capacity of our hardware, which has enabled the faster running of auctions and the like, while providing greater stability. Over the coming period, we will be focusing on improving platform security. This is something that will occur behind the scenes, and will not affect how you use the platform – in other words, we are not creating further hoops for users to jump through in order to log on or transact. If you are experiencing any difficulties with the system, please contact our support at admin@thincats.com. Over the year to October 2015, ThinCats has made 186 loans to UK businesses – almost £54m. 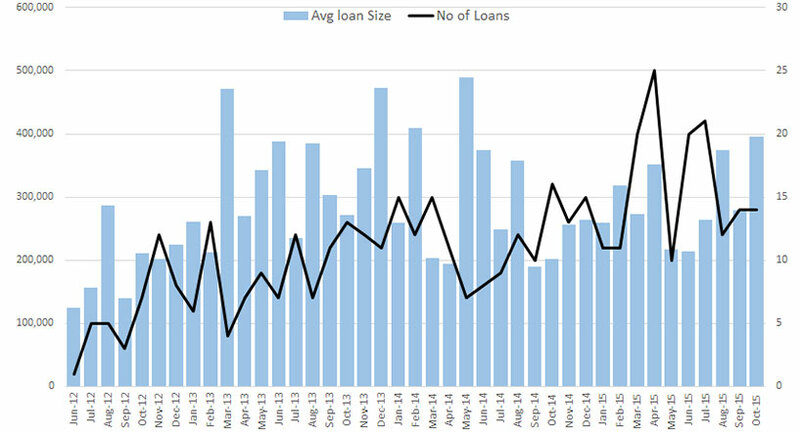 Average loan size over the time has been just shy of £290,000. Historically, January tends to be a little slow, but that hasn’t stopped the platform reaching £150m in loans.